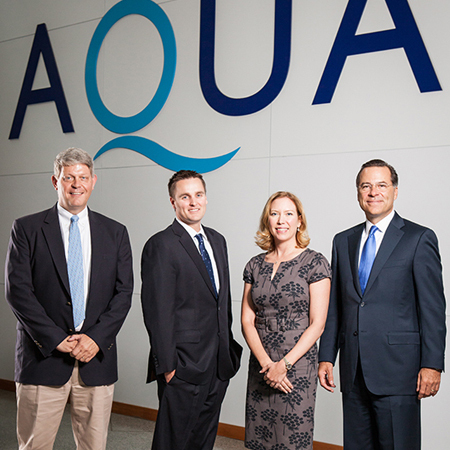 What do four members of Aqua America, Inc.’s senior leadership team have in common? They all completed the Villanova Executive MBA—and it’s not by chance. As President and CEO Christopher Franklin (’02 EMBA) explains: “One of the most important decisions a CEO can make is hiring the right people around him.” This led Franklin to seek out leaders who embodied the same values that the Villanova EMBA Program fosters—integrity, a tireless work ethic, and teamwork. In 2000, Franklin joined the first-ever EMBA class at Villanova, deciding to enroll because of Villanova’s reputation for academic rigor, its unmatched facilities, and the values of the school. “Having been out of school for some time, it was refreshing to be back in the stream of learning and current thought, and it was transformational to be able to immediately apply my knowledge at work the very next day,” says Franklin, who graduated from West Chester University in 1987. But perhaps the biggest benefits of the program were the social activities and networking opportunities—it was through this EMBA Program where he met fellow student Rick Fox (’02 EMBA). Fox, now EVP and COO of Aqua America, enrolled in the same EBMA class when he and his family moved to Philadelphia in 2000. He worked in the chemical manufacturing industry for 17 years and wanted to become better connected in his new city with the hopes of changing careers. He liked the ‘start-up’ quality of the then newly offered EMBA Program, and he points to the EMBA Program for giving him the confidence to branch out into other industries. Throughout the years, Franklin and Fox relied on their EMBA experience to think differently about their business at Aqua America, the second largest U.S.-based, publicly traded water and wastewater utility company that serves nearly three million people in eight states. Their newly acquired business education encouraged them to look at their business in an innovative way—to focus more on metrics and measurement as well as their mission. As a senior leadership team, Franklin and Fox felt it was important to expose others at Aqua America to the Villanova EMBA experience. They selected Kim Joyce and Brian Dingerdissen, who both were familiar with Villanova from their undergraduate days. Joyce (‘11 EMBA), who serves as regulatory counsel and director of public and legislative affairs, expressed interest in taking an accounting class to refresh her core business skills. But the senior management team had bigger plans for her and thought she would be an excellent candidate for the EMBA Program. As part of her capstone project, Joyce traveled to Nicaragua to evaluate water resources in rural communities—an experience that would prepare her well for her future role at Aqua America. Joyce currently oversees communications, community relations, and the company’s charitable trust in addition to leading a team with responsibilities for all regulatory and legislative policy at the federal and state levels. After graduating with a degree in finance from Villanova in 2005, Dingerdissen applied for a job at Aqua America with the help of Mike Pagano, Robert J. and Mary Ellen Darretta Endowed Chair in Finance. Recently appointed chief of staff for Franklin, Dingerdissen (’13 EMBA) ensures that the company’s vision and core values—including an increased emphasis on people—are fully integrated throughout the organization and maintains a personal connection with each department throughout the company. Dingerdissen enjoyed his EMBA experience so much that he currently serves on the board of directors of the Villanova Executive MBA Alumni organization. These four alumni also share another important characteristic: Giving back to the community. Physician and University of Tennessee (UT), Knoxville, graduate Geogy Thomas is determined to help pregnant women in East Tennessee detox avoid neonatal abstinence syndrome (NAS). "I fell in love with this community 15 years ago when I moved to Jellico to take care of the underserved," says Thomas, medical director of Dayspring Family Health Center in Campbell County and recent graduate of the Physician Executive MBA (PEMBA) Program in UT’s Haslam College of Business. "I was not prepared for the amount of drug use and abuse that I encountered. I especially was not prepared for the number of addicted pregnant women." Thomas wanted to take the next step and find a more impactful way to give back to his community. "I sat at my computer, typed in MBA and the first thing that popped up was UT's PEMBA Program," says Thomas. "With all the changes in health care today, physicians need to be more than just physicians. I wanted to do more to help our struggling patients but didn't know where to begin. I did the unthinkable and enrolled in the PEMBA Program." A program exclusively for physicians who are seeking leadership, management, and business skills, PEMBA includes a requirement for each student to develop an organizational action project that can be applied directly to their organization. For his project, Thomas tackled the development of an inpatient detox program in Jellico, a community flanked by numerous pill mills. "Our group has partnered with UT Medical Center's high-risk obstetricians to help us get these moms off the drugs while they're pregnant, or at least on a lower dose," he says. "We want them to feel safe and equip them to restore their lives and reclaim their futures. We want to give them a second chance at raising a healthy family. We want to deliver healthy babies but also be a resource to help them after they give birth, to support them with parenting, contraception, and other essential life skills." Last year Tennessee spent $60 million taking care of a thousand NAS babies. "Geogy is a physician empowered to lead and improve patients' lives," says Michael Stahl, director of the PEMBA Program. "His organizational action project dealt with a major drug addiction problem among pregnant women within our state. He is helping the moms and their unborn babies, all the while lowering the cost of health care in Tennessee." BlueCross BlueShield has seen promise in Thomas' program and recently awarded his practice a $400,000 grant. In the future, Thomas wants to help detox the partners of these women and open a transition house for those who successfully complete the program. "The PEMBA program gave me the tools I need to turn a dream into a reality and offer a lifesaving option for whole families," says Thomas. EMBA students at Purdue University contributed to the development of a web app that received the state of Indiana’s Education Tech Award. The therapy app SPEAKall! aids children with autism spectrum disorders and other developmental speech and language disorders. Participants in Purdue’s Program for Engineering Projects in Community Service originally developed the app, and the Purdue EMBA class of 2014 enhanced its business model. They developed a go-to-market strategy for the app as part of their Active Learning Project, a core component of Purdue’s EMBA curriculum. The students devised digital marketing strategies that have been implemented with good results, says Mike Zentner, a 2012 alumnus of Purdue’s global EMBA Program, the IMM Global EMBA, a Purdue information technology research scientist, and a key member of the SPEAKall! team. The app first launched on iTunes in late 2011 and was downloaded more than 10,000 times. Much collaboration and commercialization followed. The EMBA students then helped take SPEAKall! to the next level. Three students in the Executive MBA Program at the University of Denver Daniels College of Business devised a remedy for phones or other electronic devices that accidently fall into water, formed a technology start-up company, and navigated the product to market. While in the program, EMBA students Adam Cookson, Eric Jones, and Craig Beinecke conceived the product and company, TekDry, and obtained the patent. The product repairs wet electronic devices in as little as 20 minutes. The three founders met in fall 2011 (EMBA Cohort 58) and looked for real-life problems to address and study throughout the program. About halfway through the program, an undergraduate student asked one of the partners for advice to fix her phone after it fell in a toilet. The team recognized the global nature of this widespread problem and set to work on a technical solution. In parallel, they immediately began to evaluate the feasibility of the business and developed a comprehensive business plan through the remainder of their EMBA Program. Their work culminated in a meeting with a large consumer electronics manufacturer and distributor in Istanbul, Turkey, as part of their EMBA capstone international trip. The trio built a prototype that successfully dried electronic devices as large as a laptop. Shortly after their graduation, the three quickly oversubscribed a seed round of funding, resigned from their corporate jobs, and began working full time to build the business. Cookson and Beinecke were both engineers by trade while Jones was a fireman and paramedic when he entered the program. Success has come quickly with two different devices professionally manufactured and marketed in the U.S. They also launched the service with strategic partners including Batteries Plus Bulbs and have agreements in the works with other international big box retailers. TekDry has continued to benefit from the relationship with the Daniels College of Business and the University of Denver in a number of ways. TekDry’s additions to its team include recent graduates and student interns from the university. The networking power of the university also has led directly to relationships with advisers, investors, legal counsel, and insurers, just to name a few. The team stays involved by returning to share their story with a number of classes in various programs. For more information on TekDry see www.tekdry.com.